Even though the school is less than 10 minutes from ZooTampa, almost none of the 963 students at Dr. Carter G Woodson PK-8 Leadership Academy had ever visited. The school – formed last year when Cahoon Elementary and Van Buren Middle combined – serves a population that is overwhelmingly low-income. A grant from the Community Foundation allowed every student at the school to visit the Zoo during a week in November. 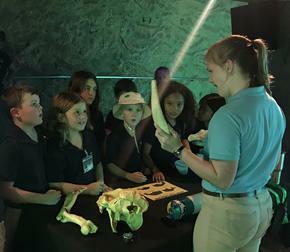 The children had fun: they petted stingrays, touched manatee bones, took pictures of Florida panthers. But fun wasn’t the main goal. The growing partnership between the school and the Zoo has both academic and emotional purposes. Ongoing activities with the students enhance their STEM curriculum and help them learn about the environment. The exposure also has emotional and social benefits, said Ruth Meyers, Zoo grants manager. Interaction with animals teaches young people empathy, and the animal kingdom gives children a view of different kinds of families and social structures, which children can identify with. Two community forums to gather information on local needs and opportunities took place this fall in Clearwater and Brooksville. 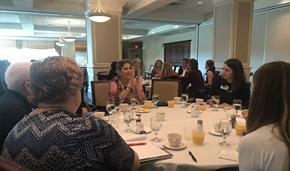 On October 18, about 50 representatives of nonprofits serving Clearwater and Dunedin gathered at the Belleair Country Club to share their thoughts about the needs they see in the community and how government, business and philanthropy can help them meet those needs and opportunities. The gathering concluded with a panel discussion led by Frank Chivas, Baystar Restaurant Group; Ron Ciganek, Valley National Bank; Nancy Ridenour, PDR Certified Public Accountants; and Ann Marie Winter, Area Agency on Aging of Pasco-Pinellas. The panel shared thoughts on how business, government, nonprofits and private funders can better work together to meet community challenges. 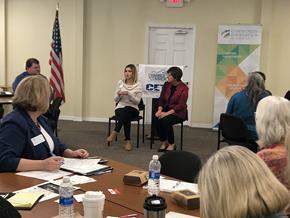 On November 1, the Community Foundation partnered with the Hernando Chamber of Commerce to host a similar community conversation with nonprofits and business leaders in Brooksville. 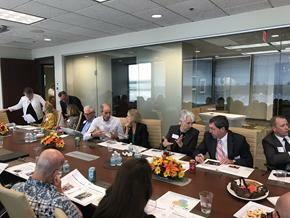 Nature Coast Council members helped facilitate conversations between the nonprofit leaders and business leaders to better understand how funding in collaboration can grow stronger communities and empower nonprofits. A look back at the October 25 event, which was won by Shepherd's Village. Social Venture Partners Tampa Bay is a fund within the Community Foundation of Tampa Bay. Donors and other funders came together on November 19 for a first look at the grants applications recommended for funding in the arts & culture and education competitive grants cycle. The Sneak Peek offered a chance to talk with others about giving priorities and gave donors another way to engage with each other and the Foundation for greater impact. Three proposals were fully funded or partially funded by donors as a result of the event. The next week, the Board of Trustees approved more than $66,000 in awards for arts & culture organizations. Approved grants to educational proposals, plus Foundation initiatives related to education, totaled more than $439,000. Stay tuned to be part of Sneak Peek in the spring grants cycle for health and human services, the environment and animal welfare. Synapse Innovation Summit: Two-day celebration of innovation and leading-edge technology across a diverse set of industries. January 23-24, Amalie Arena. Details and tickets here. Young Professional Advisor Network Gathering: January 30, 5:30-7:30 p.m., American Social, Harbour Island. WEDU Be More Awards: Celebrating local nonprofits, February 28, 11 a.m.-2 p.m., Bryan Glazer JCC. Details and tickets here. $65-$150. Log into your donor account for more information or to make a grant to one of these efforts from your fund. You can support the programs in whole or in part. You will find the link to the "Giving Opportunities" section on the upper left of the home page. If you need assistance, please email Patti Strippoli or call her at 813.609.4862.